Do You Only Have One Speed When You Swim? News: A new Mr Smooth is born! A huge congratulations from us at Swim Smooth to Jono Van Hazel (the original Mr Smooth) and his wife Anna on the birth of their baby boy Max on Wednesday! May he sleep long and peacefully through the night guys! Do you feel like you can hold a reasonable pace over longer distances but when the coach says "Sprint!" you just can't go much faster no matter how hard you try? Don't worry, you're not alone! This is quite a common problem and it is actually telling you something interesting about your swimming and how to improve it. Elite swimmers have both of these elements in place in their stroke which is why they are so fast and efficient. But what happens if you are strong in one area and weak in the other? What are your swim-symptoms? The swimmer who has a low body position but relatively good propulsion can normally sprint quite well over short distances of 50 or 100m because the extra propulsive power helps lift their legs higher in the water. However at a more sustainable level of effort, their legs sink lower which increases drag dramatically. The result is a large drop off in speed over longer distances. If you've been following Swim Smooth for a while you will know that we give equal importance to reducing your drag and increasing your propulsion. You need both in place in your stroke to be a truly fast and efficient swimmer and as we saw in the case of the Overglider above, focusing too much on one aspect can actually harm the other. Work on both drag reduction and improving your propulsion all year round and you will be on the optimal pathway to improving your swimming. Here's a classic swim session that is a good combination of technique work and some aerobic swimming. 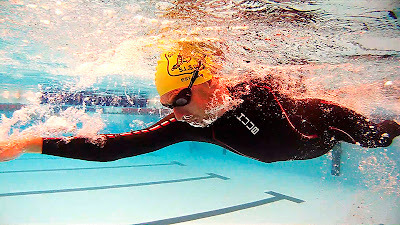 The aerobic swims keep some emphasis on your swim fitness and immediately ensure that the stroke technique you are developing can be sustained over long distances - which is essential as a distance swimmer or triathlete. The worst thing you can do in technique sessions is to become a "technique hermit" and only ever swim short distances of 50 or 100m for fear of your stroke falling apart. 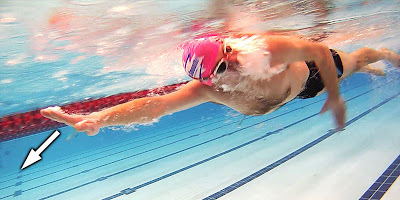 An effective stroke technique is much more quickly developed in combination with an all round program: developing both your swim fitness, pacing skills and technique at the same time. This session is a great way to do just that. 100m steady freestyle, relax and gradually loosen off your shoulders. 200m freestyle with a pull buoy, focusing on efficient roll from the hips. Visualise rotating the hips out of the way ahead of the arm stroke (see here). 300m with fins, 6-1-6 drill on the way up the pool, freestyle on the way back down. Think "shoulders back and chest forwards" during the drill to keep your lead arm straight. 400m steady freestyle, breathe ever 3 strokes on the way up the pool, every 5 strokes on the way back down. Focus on a nice smooth exhalation whenever your face is in the water. 500m with a pull buoy (and paddles if you have them). Don't kick at all but focus on pressing the water smoothly backwards to the wall behind you with a good rhythm. 3 strokes in the middle instead of 1. 400m freestyle swim as a negative split, meaning you swim the second half faster than the first. If possible check this with a stopwatch or the pool's pace clock to see if you did in fact negative split (it's not as easy as it sounds!). 300m with fins, 6-3-6 drill on the way up the pool, freestyle on the way back down. 200m freestyle on the way up the pool, backstroke on the way back down. This session totals 2500m. You can lengthen or shorten it by lengthening or shortening the swims slightly, albeit keeping the pyramid structure in place. If you are someone who enjoys a lot variety in their swimming then you'll love this type of set, there's always something new to think about and keep you stimulated. Many เกมยิงปลา HappyFishingKicktastics can easily become bored when swimming so this session is perfect for you to enjoy, the time will fly by. When you are choosing a wetsuit you'll want something at the right price that fits you well, has great flexibility and looks good on you. But should you be considering your stroke style when selecting the right suit for you? Here at Swim Smooth we certainly believe so. The buoyancy of a wetsuit has a huge bearing on how you swim in it, particularly the distribution of that buoyancy in different parts of the suit. We call this the "buoyancy profile" and broadly it relates to the buoyancy in the upper body versus the lower body of the suit. This is effected by the choice and thickness of materials in different areas of the suit. In this guide we'll outline some classic types of swimmer and what they should look for in their wetsuit, particularly in relation to its buoyancy profile. Identify which group you fall into and you'll be able to select the perfect wetsuit to make some big strides forward in your open water races this season. Obviously to bring the legs higher in the water we could add extra buoyancy to the wetsuit legs. But equally, we could also reduce buoyancy in the chest, bringing the front end down and so the legs up. This double lifting effect is one of the secrets why the 3:5 profile HUUB wetsuits are so amazingly quick for sinky leg swimmers. Conversely if a swimmer has a good natural body position we just need to maintain that with a wetsuit with a neutral buoyancy profile along their whole length. By giving them too much buoyancy at the rear we would bring them too high with the legs and leave them feeling awkward and unbalanced. So the key when choosing a wetsuit is to select one that corrects or compliments your own body's buoyancy profile to leave you sitting perfectly in the water. 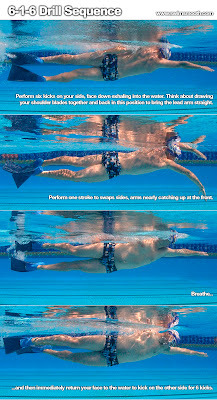 Get this right and you will swim quickly and easily in your suit. Purchase the wrong suit and you'll be much slower than you could be or left feeling unbalanced in your stroke. This guide applies to selecting any wetsuit brand but as you know, Swim Smooth are part of the HUUB wetsuits design team. With our knowledge of stroke technique and individual swimmers, we carefully tailored buoyancy profiles for each type of swimmer within the range. 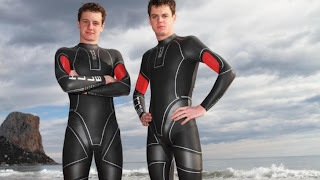 As part of this guide, we'll highlight the prefect HUUB suit for each type of swimmer. Profile: Many triathletes without a swimming background suffer from low lying legs in the water creating a huge amount of drag. They often cross-over the centre line in front of their head and drive their kick from the knee rather than the hip. Experiences: You don't have a swimming background and find swimming with a pull buoy significantly easier. You might be a powerful athlete on land but find swimming a frustrating experience. Wetsuit choice: You need a wetsuit with reduced buoyancy in the chest and maximum buoyancy in the legs to rebalance you in the water. This will bring your legs up much higher than a conventional suit with high buoyancy in the chest. 3mm neoprene in the upper body and 5mm in the hips and legs is recommended. Recommended HUUB suit: Archimedes 3:5, Aerious 3:5 or Aegis 3:5 (female version available). Improvements for sinky leg swimmers in these suits can can be phenomenal - reductions in swim times of over 20 seconds per 100m are quite common. Profile: Women are a different shape to men (you might have noticed!) and have a different buoyancy profile which needs a unique approach to wetsuit design. Not only is the distribution different but most women are more naturally buoyant overall than men and so require a less buoyant suit. Wetsuit choice: With good natural buoyancy in the water you need a low buoyancy wetsuit in both the chest and legs to avoid bringing you too high at the rear which would leave you unbalanced. We recommend a 3mm neoprene thickness all over. Recommended HUUB suit: Aura 3:3. 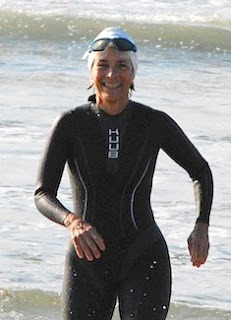 The Aura is a unique thinner wetsuit design with less buoyancy. Easier to get on and off, and leaves you feeling balanced in the water when you swim. As a bonus the thinner material is more flattering too, avoiding the chunky look of men's suits. Note: Although more rare than with men, some female swimmers do have sinky legs - follow our advice above for sinky-leg swimmers if you do. Profile: Many swimmers with a swimming background have quite a dominant leg kick and in a conventional high buoyancy wetsuit are brought so high at the rear they start to kick air. Worse, being overly high at the rear leaves the swimmer feeling unbalanced and uncomfortable in their suit. Experiences: When training in the pool you may be slower with a pull buoy although this isn't always the case if you kick more from the knee than hip. You dislike wetsuit swimming and may feel unbalanced and restricted in a conventional suit (often feeling that restriction in the shoulders). Wetsuit choice: You already have an excellent body position in the water and so you need a wetsuit with a neutral buoyancy profile. i.e. the same thickness of neoprene in the upper and lower body. We recommend 4mm all over for men and 3mm for women. Recommended HUUB suit: Male: Archimedes 4:4 or Aerious 4:4, Female: Aura 3:3. Using the exact same construction and technology as the HUUB 3:5 profile suits, you have the perfect suit to maximise your speed. Profile: Despite working hard on creating a longer stroke style, swimmers with a long pause and glide in their timing normally sit a little lower in the water than they would like. This is especially the case if they have also introduced a 2-beat kick. Whilst their legs are not as low as the classic leg-sinkers, they will still benefit from getting their legs higher in the water. a 3:5 buoyancy profile to develop their body position. Experiences: Although you enjoy swimming in a wetsuit you may find you don't perform as well in open water relative to your peers as you do in the pool. Waves and chop from other swimmers tends to stall you in the pause and glide in your stroke and may knock you off balance, leaving you quite uncomfortable swimming in a pack. Wetsuit choice: As with the classic leg sinkers, choose a design with a low buoyancy chest and high buoyancy legs. We recommend 3mm neoprene in the upper body and 5mm in the legs. Recommended HUUB suit: Archimedes 3:5, Aerious 3:5 or Aegis 3:5. You already benefit from swimming in a wetsuit but choosing a 3:5 will take your efficiency to an even higher level, locking your legs high up to the surface with its amazing buoyancy profile. Profile: Always near the front of the field, experienced swimmers have good stroke technique from their days as junior swimmers. They already have a great body position in the water and although nobody's stroke is perfect they have only minor areas to tweak and improve. Your experiences: Confident and capable, you are looking for a high quality wetsuit to transfer your pool speed across into open water. their naturally high body position in the water. Wetsuit choice: You already have an excellent body position in the water and so you need a wetsuit with a neutral buoyancy profile. We recommend 4mm neoprene all over for men and 3mm for women. Recommended HUUB suit: Male: Archimedes 4:4 or Aerious 4:4, Female: Aura 3:3. As well as having a neutral buoyancy profile for you, the extreme flexibility and release features in these suits help maintain the kick and catch technique you've refined over the years in the pool. The perfect suits to devastate the field! Still not sure which suit profile is best for you? Send us an email to help@swimsmooth.com telling us about your swimming. Or, if you're in the UK, book up a session with a Swim Smooth Certified Coach, not only will they help you develop your stroke technique but they will also give you some detailed advice on what to look for in your next suit. Too Cold To Train In The Open Water? No Problem! But if you're reading this in Europe you'll be painfully aware that winter is still stubbornly holding off spring, with air (and water) temperatures currently hovering at the seasonal norms for December and January. So how do you keep those open water skills sharp during the endless winter? By practising in the pool of course! The key thing to remember when designing open water sessions is to be creative and introduce a wide variety of challenges. Races throw a huge range of conditions and situations at you, so you need to be comfortable adapting to whatever you are presented with. You should ideally practise these skills with other swimmers in a group once a week in the pool by getting together with some friends or with your training squad. If your group is of mixed ability, use a pull buoy or a pair of fins to help the slower swimmers keep up with the fast guys. That's not cheating in this sort of session as it's purely about experiencing and becoming confident swimming close to other swimmers. 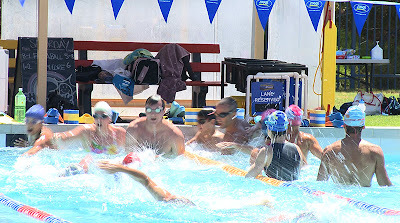 - Practise starts by treading water at the deep end of the pool and on the shout of 'go!' get up to speed as quickly as you can, using a shorter stroke as you accelerate like a sprinter taking short strides out of the blocks on the running track. 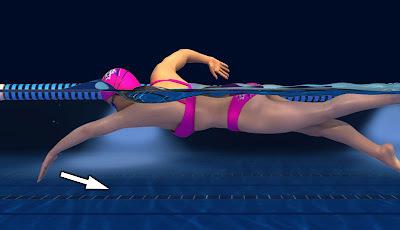 This acceleration technique is important for starts but also for getting back up to speed after a tight turn - you can use it to drop other swimmers who are drafting you. Practise accelerating up to speed quickly and efficiently from a treading water position. A pull buoy is optional - don't kick at all if you use one to keep the focus on the arm stroke. - Organise yourself into drafting groups, using both arrow head and in-line drafting formations. Swap round the lead swimmer regularly and get as close as you can to the other swimmers without disrupting their stroke. 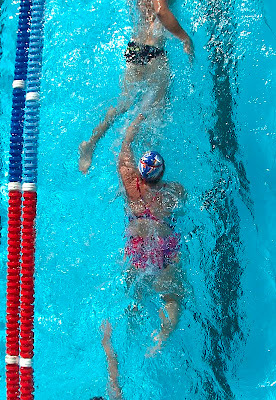 When swimming to the side of another swimmer, experiment with matching your stroke rate to theirs to avoid clashing arms. drafting or you will disrupt their stroke (and yours)! - When drafting, get comfortable being close to other swimmers, yes the turbulence will disrupt your stroke rhythm and this can feel off putting at first but don't be tempted to seek out clear water. The benefits of being in this draft zone are huge (saving you up to 38% of your energy expenditure ) and by becoming accustomed to it you will be able to swim much faster than you otherwise would. Experiment with a slightly shorter punchier stroke style to be more efficient in the disturbed water and turbulence. - Include short races over 50, 100 and 200m where you are drafting and the lead person is trying to drop the guys behind. 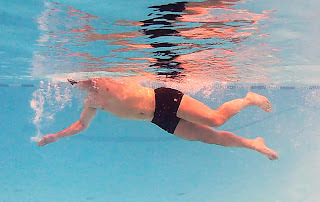 The lead swimmer can make this tactical by swimming at a steady pace at first and then surprising those behind by surging unexpectedly to try and develop a gap. If you're following the lead swimmer stay aware and responsive just as you should be in a real race situation. - When swimming in drafting groups, include the turn at the end of the lane in your swim (if you've got use of multiple lanes duck under the lane rope into the next lane to make it harder). This creates a bit of chaos and forces you to improvise and quickly find the draft zone again - think quickly and don't hesitate or you will lose the draft! swimmers is sure to create some race-simulating chaos! - Whilst swimming alone in the lane, close your eyes except when lifting your head to sight forwards. This gives you useful practise of getting a little disorientated and it really highlights how straight you can swim (or can't swim!) without following the line on the bottom of the pool. Find out more about good sighting technique here. That's just a short list to give you some ideas but get creative and use the environment and resources available to you to create your own sessions. Coach Nicky Proctor from York Triathlon Club just wrote in and told us about a session she ran with her squad where she divided everyone into teams and they raced to collect coloured balls (taken from the kiddies ball pit) and then dove for shells and sinkers from the pool bottom, all competitively for points. Her swimmers got mini-eggs and chocolate bunnies for prizes (as it was Good Friday). Great idea Nicky! As you know, at Swim Smooth we're fans of threshold (e.g. CSS) training for the majority of your distance swimming fitness sessions but open water skills sessions are the perfect opportunity to include some sprint work in your training too. The head to head nature of these sessions is perfect for sprint training and combining two sessions into one like this is very time efficient. 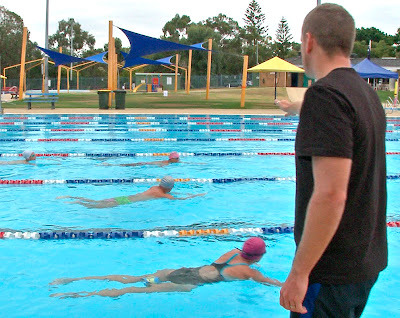 We are lucky with Perth's climate that we're able to swim in the open water all year round but in our squads we still like to practise these skills once a week in the pool. The controlled environment makes it very easy to coordinate the session and give coaching instruction and feedback to swimmers. We suggest you aim to complete a session like this once a week in the pool (in Perth we run it on a Saturday lunch-time). It's a lot of fun and you will really notice the benefit to your open water swimming when the temperatures are warm enough to get into the open water.